The painting is called 'Saved' by Charles Vigor and is based on an actual fire at an orphanage in London sometime around 1890. It was exhibited in the Royal Academy in 1892 before being bought by a Mr James Wood JP who presented it to Southport Council; they then gifted the painting to the Fire Service College at Morfen-in-Marsh in 1973. 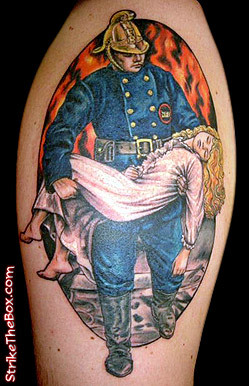 Seth, the tattoo's collector, is an Officer and Watch manager at the Blidworth Fire Station in Nottinghamshire, UK. Blidworth Fire Station began its existance as a single horse drawn wagon just before the outbreak og World War II. It later grew to become a station to service the coal mine head in Blidworth as well as the village itself and the surrounding areas. It moved to the other end of the main street in the 50's before being rebuilt back on it's original site in the late 80's when the pit closed, as a more modern single engine station. Blidworth fire station serves most of Sherwood Forest and its towns and villages alongside the main Fire Station in Mansfield.